Do you sweat like a pig? Chances are you don’t, especially if you can wring out your shirt at the end of a hot day. Contrary to popular belief, pigs are unable to sweat; instead, they wallow in mud to cool down. Their mucky appearance gives pigs an undeserved reputation for slovenliness. In fact, pigs are some of the cleanest animals around, refusing to excrete anywhere near their living or eating areas when given a choice. Pigs are misunderstood in many ways. Many people think of them as portly and stupid, but the NATURE program The Joy of Pigs shows us how intelligent pigs really are. (They are naturally lean, too, unless they are overfed by humans.) Pigs are smarter than any other domestic animal. Their ability to solve problems, like the pig I.Q. test on The Joy of Pigs, is well-documented, and they are considered by animal experts to be more trainable than dogs or cats. Piglet, “host” of THE JOY OF PIGS. Pigs are difficult to classify. In popular culture, they appear as everything from sweet simpletons (CHARLOTTE’S WEB) to wicked tyrants (ANIMAL FARM) to brave heroes (BABE). To pig farmers, the animal is a commodity. To truffle harvesters, pigs are reliable hunters whose keen sense of smell locates these pricey fungi. To scientists, pigs are unique as one of the only large mammals that exists, in one form or another, in every part of the world. Every continent bears the imprint of the pig’s feet — preferably in a nice mud puddle. Red river hogs in West Africa, bearded pigs in Borneo, pig-like peccaries in Bolivia, and outlandishly tusked Indonesian babirusa all enjoy similar lifestyles of food, water, and a good roll in the dirt. These pigs’ European ancestors became some of the first domesticated animals thousands of years ago. Wherever humans have ventured, they have brought pigs along with them. Colonists carried pigs with them to distant lands, proliferating pig farming throughout the world. In the United States, raising hogs is big business. In 1997 alone, United States hog farmers raised more than 58 million head to support growing demands for pork. 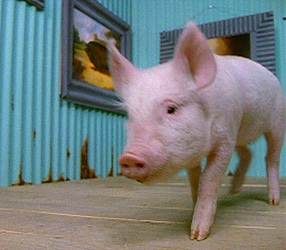 But the popularity of pigs as pets is growing, and many Americans now keep pigs in their homes. 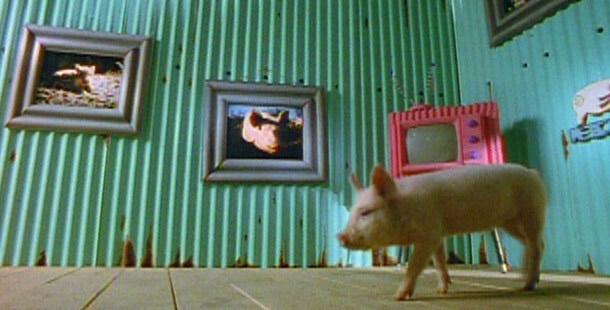 So when dinner’s served in those homes, it’s made for a pig, not from one!